Masu is the name for a measuring cup used in Japan in the past for measuring liquids, or rice and other grains. It was cubed-shaped, so the top formed a square, and by extension and as you can see in the following patterns, masu in this case means a square. 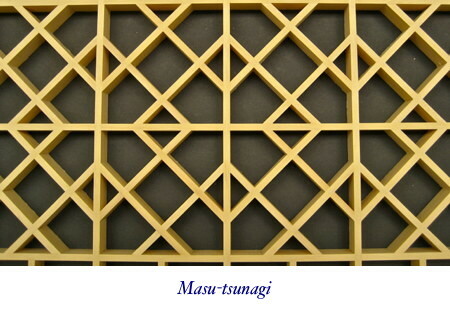 The masu-tsunagi pattern is simply a square lattice rotated 45° to fit within the square jigumi. The critical aspect of this pattern is that the four parts of the square lattice must be exactly the correct length so that it fits snugly within the jigumi. This attractive pattern is in the same family as the masu-tsunagi above. Because of the additional two diagonal pieces, though, the mie masu-tsunagi is a more complex and time-consuming pattern than its relatively straightforward sibling. Here, mie means “triple”. Like many of the other patterns, this can be used as a feature band or bands or as a top and bottom border for other patterns in a shoji. This pattern also looks stunning in a ranma. 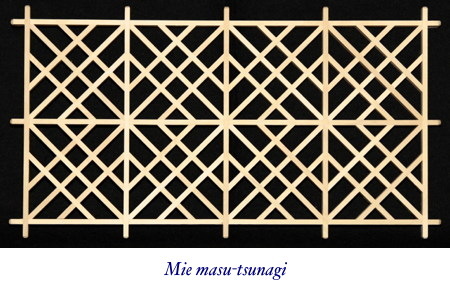 This pattern is very similar to the chōchin izutsu-tsugi, but here the squares are formed with 45° miters, and are held in place by jaguchi on the ends of the locking pieces. While the pattern appears relatively simple, it is in fact quite challenging because the jaguchi ends on the locking pieces have to be cut accurately first time. The difficulty is further compounded by the fact that the half-lap joint has to be exactly in the center of the locking piece, or the squares and locking pieces won't line up, and the pattern will look very ordinary. This pattern is a good test of accuracy in marking and cutting. Patience is also essential.